Take Your Halloween Costume From Meh to Amazing w/ These Contacts | Nerd Much? AC Lens has what you need for your costume. There’s no denying that we here at Nerd Much? love all things Halloween, which is why we always begin talking about the holiday when it’s socially acceptable to do so (okay, so maybe a week or so before!). And, as we’re always on the hunt for cool Halloween stuff to share with our readers, we’ve come across something that’s going to take this year’s costume from a B to an A: Colored Contact Lenses by AC Lens. What makes AC Lens’ contacts your go-to choice when putting together your costume this year? In our opinion, it’s the ridiculously large selection that they have available. They have over 70 different pairs of colored lenses available in a variety of different styles. 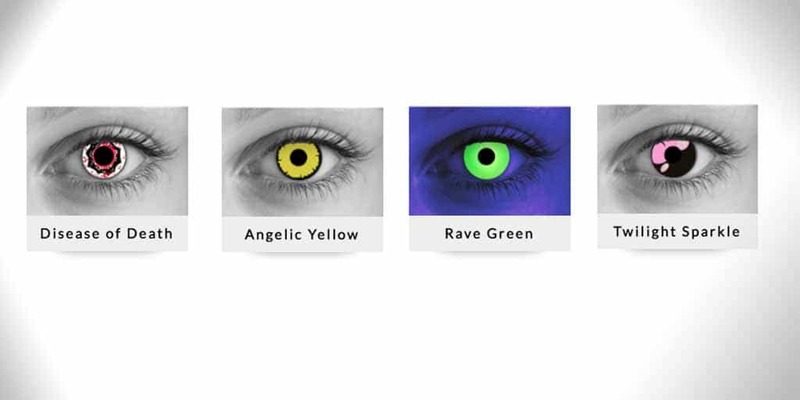 From Twilight Sparkle, which gives your eyes a Sailor Moon look, to Angelic Yellow, which gives your eye a sort of Mystique look, to white zombie infection eyes, chances are you’ll find the right contact type for your costume. Going as the Hulk this year? Check out these vibrant green contacts. Going as an ice walker? Check out these lenses to look like the Ice King, himself. There are numerous colors and designs available, ranging from vampire red to even having a Poke ball design. With the sheer number of unique lenses available, the possibilities for Halloween costume (and cosplay) creations are endless. Their impressive line of contacts are available with or without a prescription, and they’re all FDA approved (so they’re completely safe). Each prescription is verified with the eye doctor to ensure correctness, so if you can’t exactly read your doc’s handwriting, fear not. Even if you don’t require a prescription for your vision, you’ll still need a prescription from your eye doctor to ensure that the contact lenses are sent with the correct base curve. Contacts are shipped quickly, arriving in 1-5 days after Rx verification, so be sure to order at least the week before Halloween or any Halloween parties you’re heading out to. Each lens sells for $24.47, making a pair $50.